On October 5, 1999, while Dave Bridges and Alex Lowe were investigating a potential ski descent on the southwest face of Shishapangma, an avalanche buried them. This spring, their remains were found on the mountain. Then and now, much of the global media coverage focused on Lowe, who was widely considered one of the top alpinists in the world. Mainstream news stories sometimes referred to 29-year-old Bridges merely as a "cameraman" or "filmmaker" who died alongside him. But Bridges—an accomplished rock climber, alpinist and paraglider—was much more than that. A gifted athlete and adored individual, his life and his loss deeply affected those who knew him. "He was probably one of the nicest guys you'll ever meet. Ever. You'd love to have him as a son or next-door neighbor," his climbing partner Brad Singer said. "He was extremely humble, very self-effacing." Bridges started climbing soon after his family moved to the San Bernardino mountains when he was about 14 or 15 years old. His parents, not climbers themselves, supported his newfound passion, driving him an hour to the nearest outdoor gear shop and buying him equipment whenever they could afford it. Dave took climbing lessons at Mike Rigney's sporting goods shop in San Bernardino, and the two climbed together for years after. "He just loved it," Rigney remembered. "Anytime he was outside on a rock or whatever, he just came to life." Soon Bridges began climbing compulsively around southern California and Yosemite. Fewer than two years after he first tied into a rope, he was chalking up on classic Yosemite rock routes such as the Lost Arrow Spire Tip (5.7 C2; 512b, 250') and Lunatic Fringe (5.10c, 140'). Dave's brother, Dan, described a sort of instinctual bodily awareness that helped Dave work out the moves to complex routes in his mind: "Dave went to someone's house and they had a highwire. [He] just studied it for a second, and then he just walked across it.... He just figured it out. And I think that's where the beauty was. He knew every movement of every route that he was going to do." Soon Dave gained an impressive reputation in the local community. "He was just so much better than so many people his own age," Dan recalled. Dave's skill drew other talented climbers to him. Fourteen years his senior, Steve Untch was among those new friends. Dan remembers their dad taking fourteen-year-old Dave to watch Untch deliver a climbing slide show at a restaurant in Running Springs. "That's how it all started," Dan said. He laughed. "So we have to blame everything on Steve." Untch later mentored Bridges' transition from rock climbing to alpinism and high-altitude mountaineering, shepherding him from the sunny cliffs of southern California to glaciated peaks in South America, Europe, and Asia. On high mountains, Bridges demonstrated a near-mythic endurance. "I understand how you can run on adrenaline," his friend Joel Koury said, "but my adrenaline is like 300 feet from the summit—for Dave, it was 3,000 feet." 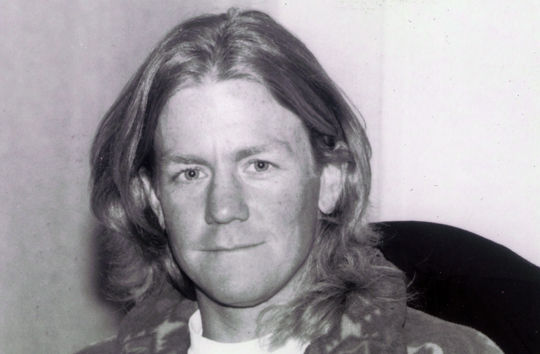 "He had probably the most endurance that I'd ever seen of anyone at any level," Brad Singer told Alpinist. "He could run 5-minute miles without any training whatsoever." Singer, a fit climber himself, remembered a time when he and Dave were running, and he could feel that he was holding Dave back. "There's no need to stay with me," Singer told Bridges. "Run ahead and do what you need to do." Instead of taking off at his usual pace, Dave instead ran backwards. "There was no braggadocio in this," added Singer. "He'd run two or three miles backwards while I ran forwards. I didn't feel bad about it, and he got great training." "Dave was just a natural for the high-altitude stuff," recalled Rigney. He summited Denali (6190m), in Alaska, at age 19. He climbed Chimborazo (6268m) and Cayambe (5790m) in Ecuador three years later, and he headed to the Himalaya not long after. "I can remember saying to David every trip he would take, 'Dave, just make sure you come back,'" Singer told Alpinist. "He was incredibly safe and incredibly good at knowing his limitations, [but] he knew what he was getting into. He knew Himalayan climbing is an extremely dangerous game ... as talented as you can be, it doesn't matter." 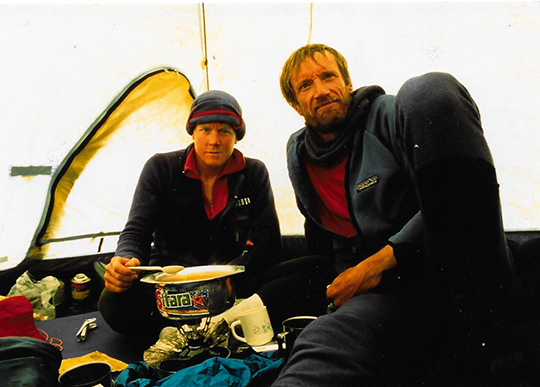 During his first Himalayan expedition in 1994, Bridges joined Untch and Australian climber Michael Groom for an attempt on K2 (8611m). A twisted knee stranded Groom at Camp II, and on July 25 Untch and Bridges left base camp to retrieve him. After becoming sick with food poisoning, Bridges remained at advanced base camp while Untch continued alone. Later, while he scanned the mountain for signs of his descending partners, Bridges heard shouts from a Japanese team. He looked up, spotting what he thought might be rockfall or jettisoned gear. As he ran closer, though, he recognized a distinctly human form clad in a familiar red and yellow suit. The old fixed line Untch had used to rappel had snapped. Bridges helped lower Untch's remains into a crevasse. "I had known what I would do in such a situation for some time now," Dave wrote later in Untch's journal. "Steve and I had discussed it... I knew for a fact that Steve would want to remain there." "I think that [Untch's death] really set David back a bit. It didn't curb his enthusiasm for alpinism, but I think he kind of lost a hero at that point," Singer told Alpinist. "Still I think it made him all the more intent on being able to climb at the highest level because he what was out there and he saw what he could do and what he could achieve." The next year, Bridges returned with Joel Koury and John Cleary to climb Ama Dablam (6812m). In preparation for the trip, Dave taught Koury to ice climb at a small frozen waterfall in Utah. Koury scoffed when Bridges told Koury to stand up while belaying, instead of sitting, and to be ready to move. "I've been climbing for years with you, dude!" Koury said. "You're gonna tell me how to belay?" Twenty feet into Bridges' lead, a dinner plate of ice bounced down the face, right into Koury's nose. Later that trip, they met another climber introducing his friend to ice. Koury remembers turning around to greet the other novice only to find himself looking at another guy with the same blue nose and black eyes. Bridges went on nine high-altitude expeditions between 1994 and 1999. He began filmmaking on Baruntse (7129m) in 1998, where he chronicled big-mountain skier Chris Davenport's ski descent. 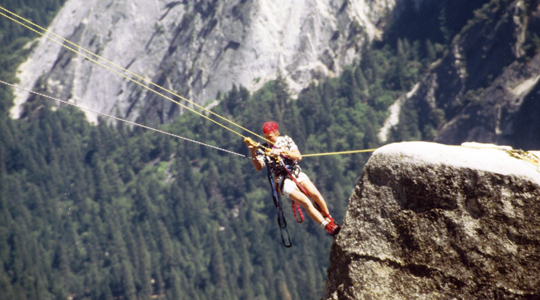 In an interview with Red Bull, Davenport remembered Bridges encouraging him through his first high-altitude experience. "Dave Bridges was super-solid on the climb...and when the climbing got really hard and I was second-guessing myself, Dave said, 'Hey man, this is what it's all about!'" 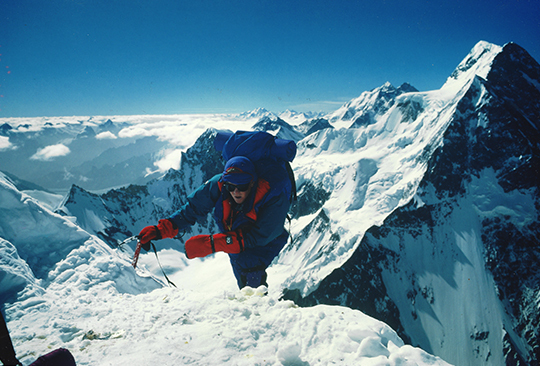 In 1999 Bridges filmed Michael Groom and Lincoln Hall's climb of Makalu (8485m), all the way to the top. "So Dave is stopping, pulling out the camera, turning it on, all while doing an 8000-meter peak without oxygen," Koury remembered. "The climbers are gasping for breath and Dave is right there with them, and he's just chatting and asking them questions," said Mike Rigney. According to Dan Bridges, Dave's incredible fitness contributed to his success. He summited before Groom, turned around, and steadily followed Groom up to the summit with the camera. "And there was no shaking in the camera," said Dan, "You know, normally, the footage is all over the place." As a result of such high-quality footage, Koury recalled, The North Face invited Bridges to film Alex Lowe and Conrad Anker on a ski descent of Shishapangma. "I remember [Bridges] saying to me, 'I'm going to be climbing with the big boys.'" To which Koury replied, "If there's anyone I've ever met who can climb with the big boys, it's you." As Tyler Stableford wrote in Outside in 1999, Bridges's role in that expedition was truly "the most hypoxic job on the mountain," as he needed to jockey back and forth, ahead of and behind the climbers, in order to get compelling and varied footage—all while shouldering the weight of camera gear. Bridges took his job seriously. Before he left, Koury remembered, Bridges had made a detailed list of reminders for the expedition, including such instructions as "always get above the climbers," "always carry extra batteries," "make sure the lens is clean," and, "when in doubt shoot more footage." "That was just the kind of person he was," Koury said. On the afternoon of October 5, 1999, Alex Lowe, Conrad Anker, and David Bridges were hiking above base camp when a cornice broke some five thousand feet above them. The avalanche injured Anker. Lowe and Bridges vanished beneath the debris. As capable as Dave was in the mountains and behind a camera, his friends remembered his kindness and humility most of all. More than sixteen years later, they remain deeply affected by what happened. "You never put him out if your mind," Brad Singer said. "Something comes up and and it makes you think of him." In situations like this, people often talk about closure, about how finding and perhaps recovering the bodies can afford loved ones an opportunity to say goodbye. But among Bridges' friends, feelings are mixed. "This whole thing is just really tough on everybody," Koury told Alpinist. "I had done a pretty good job of putting it behind me and getting on with my life...then all of a sudden the mountain burps and these guys are back with us again." Singer related, "When they found his remains it was kind of a stab in the heart again. It brings up all the good memories. But it brings up a lot of pain, too." "A lot of people have said it's kind of a blessing to find his remains, and people are wondering if we are going to bring him back," Dan Bridges said. "It seems absurd to do that—not just logistically but morally in a sense. He has been buried up there for this amount of time, and we would just end up taking him home, cremating him, and taking him back—because that's where his heart is laid, and that's where his soul is."